When worn, decayed, broken, or cracked teeth compromise a smile, the result can be lowered self-esteem and impaired dental health. 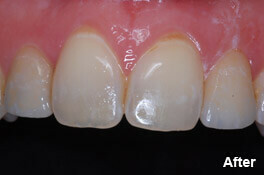 Your smile can be restored naturally with all-porcelain crowns, also known as ceramic crowns. These metal-free crowns are matched to your tooth color and can greatly improve the appearance of your smile. Modern ceramics are durable and translucent in appearance. Fine dental porcelains closely resemble natural tooth enamel, and they resist stains, so your smile will remain bright and luminous for years and years. At the Boston Smile Center & Implant Dentistry, Dr. Sasson has developed his own method for creating ceramic restorations, called Ceramel®. Using this method, he ensures patients receive an extremely lifelike result. 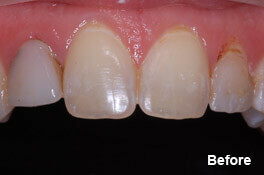 Please visit our smile gallery to see how amazing the change can be. After many years of being self-conscious of his 2 front teeth, John finally fixed them. All-porcelain crowns provide the function he has always wanted, along with the aesthetics to finally allow him to truly be proud of his smile.